Home with Casita. Smaller home is currently occupied by family. Perfect guest house or great for those that are caretakers for family and want their privacy. 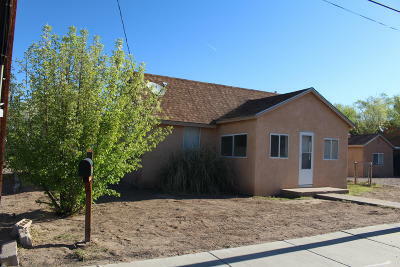 Larger home is 3 bedrooms/1 bath. guest house is 1 bedroom/1 bath with many custom aspects. Easy access to Coors Blvd, Central Ave and the freeway. Come check it out today!Please do not disturb family members in the smaller casita/guest house. DIRECTIONS: From I-25, Exit 223 West Onto Avenida Cesar Chavez. Continue Past Goff Rd, Turn Right On Anthony, Property On The Corner Of Bridge And Anthony, Park In Backyard.from Coors And I-40, South On Coors Past Central To Bridge. Turn Left On Bridge, Left On Anthony. Property On The Corner Of Bridge And Anthony, Park In Backyard..